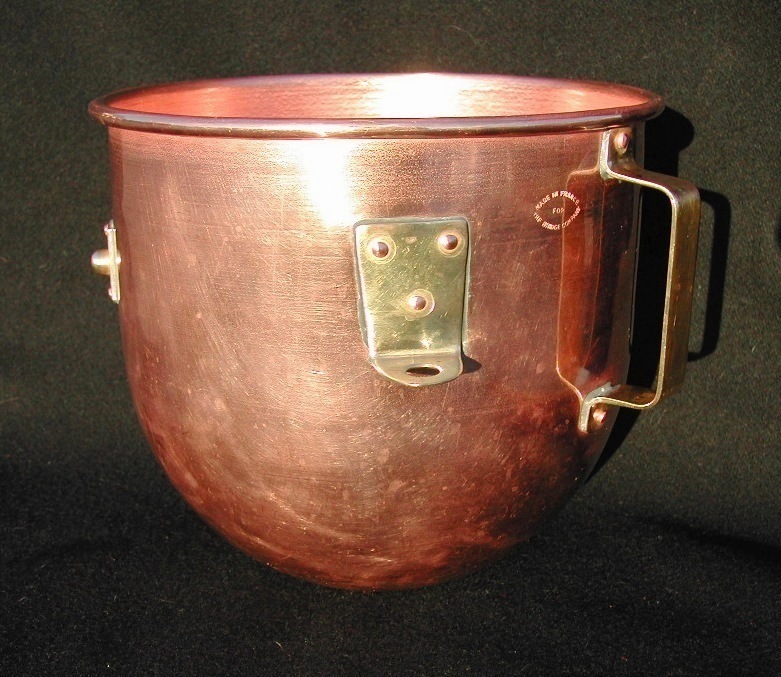 This rare and no-longer-made “old-school” copper and brass bowl was made in France for The Bridge Company in New York City (now Bridge Kitchenware in New Jersey). I bought this bowl from the store on East 52nd Street on November 17-2004, 09:44 AM. They had two left! They are scratch and dent left-overs. They were originally $185 plus shipping. I am buying one of them for $127.50 shipping included! You can clearly see in the second photo the stamping on the side of the bowl “MADE IN FRANCE FOR THE BRIDGE COMPANY”. 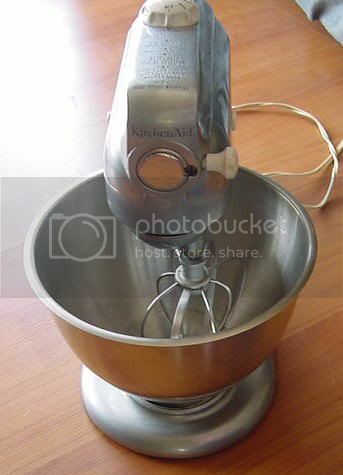 This bowl is the 5-quart size made originally for the KitchenAid Model K5A mixer. One of the photos shows it in place in my old K5A. It holds exactly 5 quarts. It stands 7-1/2 inches tall and is 8-1/2 inches in outside diameter at the top. It weighs almost two pounds! The bowl is made of copper and the attachments (the handle and the three fixtures that fit into the receptacles on the mixer) are made of brass. This is a very sturdy piece of kitchen equipment for a serious cook. This bowl fits a variety of models that feature the lifting bowl. It will fit all KitchenAid 5-quart narrow bowl stand mixers including all K5 heavy duty mixer series and even the Hobart N50 mixer series. You can no longer buy a new one of these bowls; Bridge Kitchenware no longer sells them. On the Fantes website, you will see under KitchenAid parts a listing “Copper Bowl for 4.5 Qt. Bowl, fits inside KA Bowl, solid copper, #98870. Discontinued by the manufacturer”. 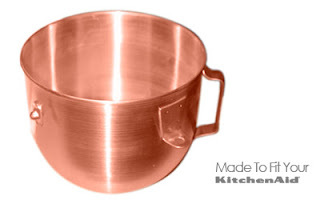 Only one manufacturer, French Copper Studio, now makes a 5-quart copper bowl that fits these KitchenAid mixers but it lacks the lovely brass fittings; it’s priced at $299. I have used this bowl many times for whipping egg whites and we can attest to the fact that it is unquestionably and absolutely the best for whipping egg whites! The bowl you use to whip egg whites really does make a difference. When air is whisked into egg whites, the mechanical action denatures the proteins in the whites. The denatured proteins coagulate, stiffening the foam and stabilizing the air bubbles. Copper bowls produce a creamy foam that is harder to overbeat than the foam produced using glass or stainless steel bowls. When you whisk egg whites in a copper bowl, some copper ions migrate from the bowl into the egg whites. The copper ions form a yellow complex with one of the proteins in eggs, conalbumin. The conalbumin-copper complex is more stable than the conalbumin alone, so egg whites whipped in a copper bowl are less likely to denature (unfold). In a non-copper bowl, if the foam starts to get overbeaten, the proteins become completely denatured and coagulate into clumps. There is no going back from the clumpy mess to nice foamy whites, so overbeaten whites must be discarded. 4 ½ inserts Fit 4 ½ qt KA mixers -- KA 45 or K45SS, or the KA Classic mixer. I bought one for my niece as a wedding present [along with the mixer]. This French made Kitchen Aid attachment was designed by Pascal Brunstein, voted the best French pastry chef in 1993. Also seen on FoodTV.com ! This is a small version of similar coating pans/drums used today in commercial candy manufacturing! 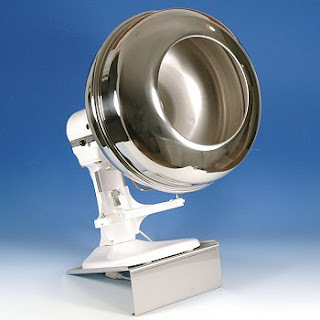 Perfect for coating nuts, truffles, and a wide variety of confections with tempered chocolate and other coatings. It also sugarcoats almonds and dried fruit and turns them into succulent dragees. This stainless steel Confectionery Coating Pan is round in shape with a 16" diameter, width 9 1/4" and front opening of 9 3/8". For optimal performance incline the KitchenAid mixer to a 30 degree angle, using the stainless steel Incline Stand included with the set. Fits both 5 quart and 6 quart KitchenAid Mixing machines with a 3/4" square attachment slot. KitchenAid Mixer NOT included. Operating manual NOT included. This item requires candy making knowledge and skill to achieve optimal results. The KA-5L BeaterBlade works perfectly in any of the older Hobart-made 5 quart mixers -- K5-A, K5SS, KA Model G, Hobart N-50. It will show you all the ways to use vintage KA attachments and the advantages of each. And on top of it, there are some fantastic recipes. When you call Ajax Electric ask for Kirk or Christine and tell them Kelly Beard recommended them. Don't launch into a story, they're too busy to be interested and will shut down. My routine service on mixers I pick up off street sales is always $37.50 unless it needs parts. by entering item number 746802 into the search engine prompt. The cost is $16.85 plus shipping. This item is a special order item. I have ordered from this site and found their service to be good. D.L. 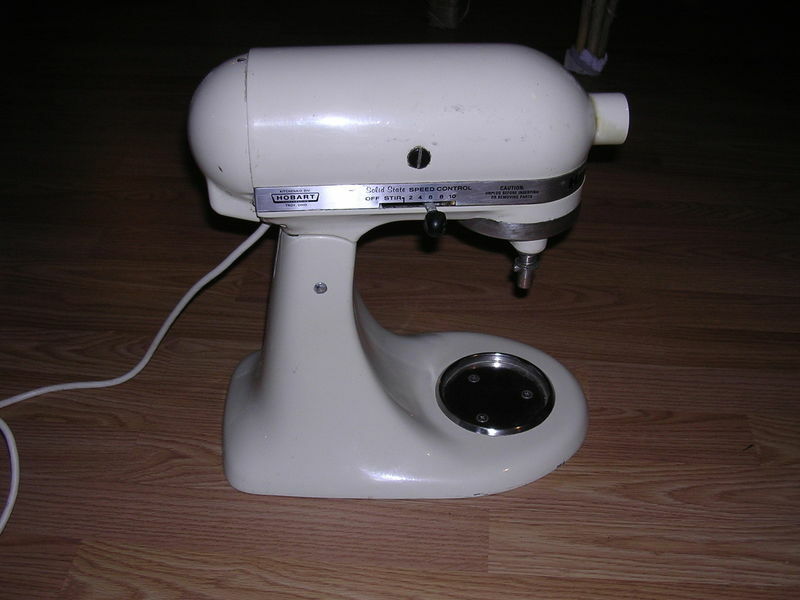 Walker , Inc. 2808 Kellybrook Lane Lansing MI 48910 phone (517) 374 7475 makes a hook to fit this mixer. I just bought one. Cost is $92.55 plus shipping & tax. It is part # 061858. "The main number 1 problem that I find with electrical kitchen appliances is that I find that the vast majority of failures are NOT due to poor design, or bad manufacturing; instead the appliance fails because the user causes the electric motor to over heat and fail because THEY DO NOT KNOW WHEN TO STOP WHEN THEY HEAR THE ELECTRICAL MOTOR STRAINING TO DO ITS JOB!!!!!!!!.. Period.. Sorry for the caps, but I am really trying to make this point!!.. Most modern Americans equate high purchase prices to indestructibility.. This is especially true with blenders, juicers, food processors, and stand mixers.. There is a wide variety of electric motors for a manufacturer to choose from when specing out an appliance during the design stages before the appliance is offered for sale to the public.. There can be an astounding difference in price between two electric motors that to the untrained eye appear to be very similar.. A better quality electric motor that is capable of withstanding more strain (torque on the motor) often accounts for at least 50% of the price increase in a commercial kitchen appliance as opposed to a home consumer one.. I will provide the following concrete example.. The smallest commercial stand mixer readily available in the USA is the Hobart N50 5-quart mixer.. 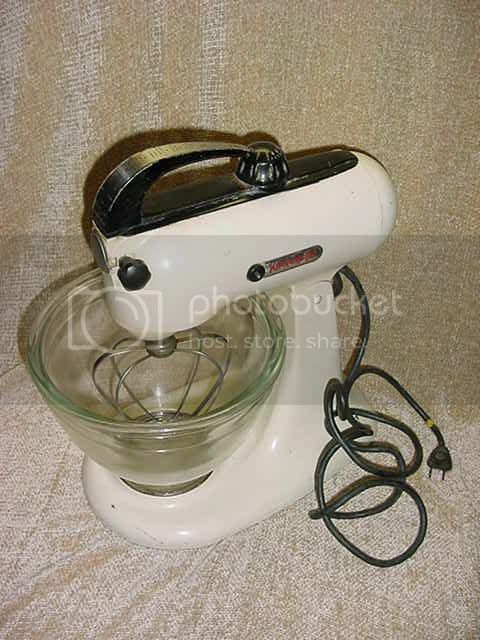 It has all of the appearance, and accessories, of the Kitchen Aid Professional 600 stand mixer, with the exception of the power control switch and the colors.. 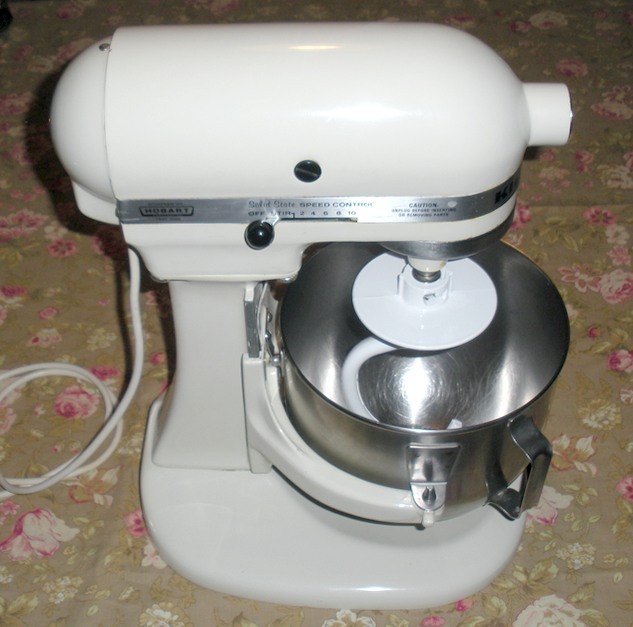 The Hobart N50 is usually painted a dull battleship industrial gray, and it has the high-quality 3-position (1st-2nd-3rd speeds) control switch that all Hobart commercial mixers have. The speeds on a Kitchen Aid mixer are controlled by a sliding rheostat switch that regulates the amount of electricity that the electric motor receives. The speeds on the Hobart N50 are controlled by the 3-position lever switch which in reality IS NOT an electric switch, but instead a gear shift lever. Unlike the gears on a manual transmission car, which is equipped with a clutch that allows for changing gears while the gears are moving; the Hobart needs to come to a complete halt before changing the gears otherwise the gears will be stripped, necessitating a VERY costly repair job. 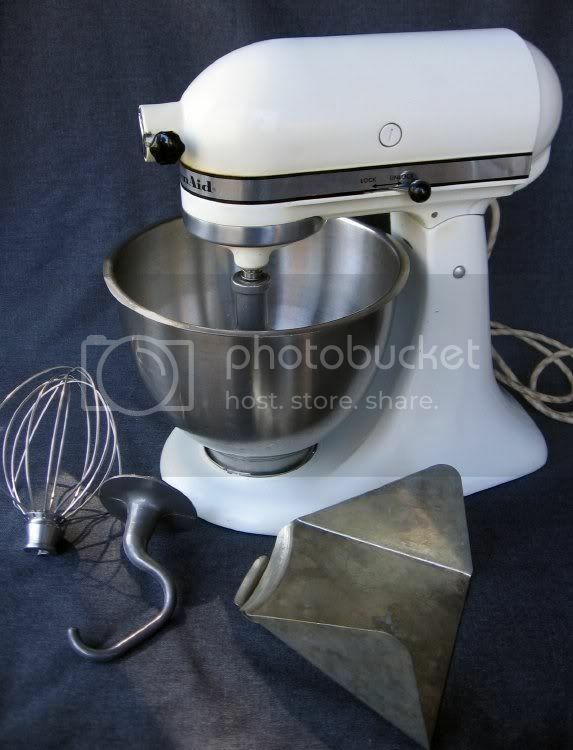 Both mixers come with their respectively-sized 5 and 6 quart SS bowls, a paddle, a whip, and a dough hook. The overall quality of EVERY component on the N50 mixer, as well as the attachments, is light years higher for the Hobart compared to the Kitchen Aid.. This is especially true of the gears, the gear changing mechanism, and the electric motor on the Hobart N50 mixer..
With the KA design, a LOT of power is lost as the energy transfers through the motor and down through the dough hook, vibrating away out into space.. The Hobart mixers, with their far more efficient and powerful motors, are able to overcome these design inefficiencies. The main problem that I find with many home cooks is that they want near commercial quality, or actual commercial quality kitchen appliances, but they are simply not willing to pay for that quality. I cannot tell you how many times I have heard people tell me that they will just purchase the less expensive appliance, wear it out, and keep purchasing another, only to trash and wear out that one. I know one person that could have purchased a commercial stand mixer, food processor, and blender for all the money that they have spent purchasing multiples of the cheaper appliances..
A bad behavior that I find increasingly more common is people deliberately purchasing an appliance knowing in advance that they are going to abuse it.. Then, they try to claim a replacement under warranty, very often successfully. It is amazing how often this type of person can get 1-2 appliances replaced under warranty before the manufacturer catches on, and refuses to honor the warranty any further. Of course, this is a primary reason for the higher costs of many of today’s kitchen appliances. I cannot overstate the importance of learning to listen to your kitchen appliances, especially if you do not own the best-quality ones that can easily handle the tougher jobs.. At the first sounds of the electric motor struggling, STOP what you are doing!! Take a moment to really evaluate what you are doing. In most instances, removing some of the food from the tool, and proceeding to work in batches will keep you from destroying the appliance. By the time that you smell smoke, or that "electrical" smell, permanent damage to the motor has almost always occurred. After that, you either have an appliance that never again works as well as before it was damaged, or else replacement is immediate, or perhaps 1-2 usages away." Phoenix [KA 4-B] ----- THE ORIGINAL & THE BEST! "Looking for a seriously tricked-out and colorful mixer with massive power? Hobart, the commercial mixer folks, are offering customized, painted vintage mixers. They have a hefty price tag to match, but these babies can mix. Mixed Up Jake is a site created by Hobart to promote their vintage mixers, offered with customization and colorful painting, like the racing stripes mixer pictured above. They repainted the N50 Hobart mixer above bright blue with a racing stripe, muscle-car style, and auctioned it off for charity last weekend. In fact, the proceeds from all of these mixers go to charity. You can visit their site to pick out a mixer, choose the color and the graphics, and then share it on Facebook. These come with a price tag, though — they run about $2500. 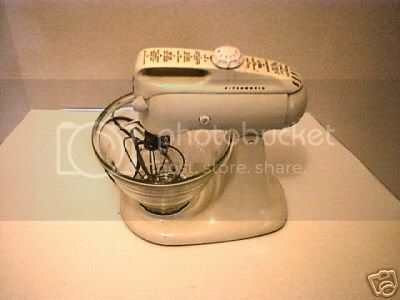 • See more: Mixed Up Jake - Hobart's site for customized mixers." 1978 K5SS replaced the K-5A as the new solid state version. Post-war versions of the attachment (that went with the K5-A, K4-B, 3C, 4C, and so on) lack the indicator and were first made with both wood buckets. If I recall correctly, the wood-bucket units were made in two sizes. At some point the wood bucket was replaced with the green fiberglass unit, which came with a reversible stand that allowed use on either of KA's mixer offerings (tilt head or bowl lift). In 1978 K45SS was introduced as the solid state version of the K-45. 1962 4.5 quart capacity model K45 was introduced. The most popular KitchenAid mixer ever, the K45 is still an important model in the line. It replaced the beloved Hercules like K-4B! Colander & sieve -- This is the style that fits in the top of the standard mixing bowl. This design is necessary on the tilt-head mixers (for obvious reasons) but eventually they started using the same design for the K5-A. 1979 The last K-4C was produced. 1950 Model K-3C - Model K-3B cosmetically re-designed. Has only a multi-purpose beater. There is no dough hook or flat beater made for it. KA sold a kit specifically for conversion of the 3C plate to a 4C plate, so the 4C bowl could be used on the 3C. The kit from KA included the replacement plate, and either a glass or aluminum bowl. 1955 KitchenAid mixers appeared in new colors at the Atlantic City Housewares Show… Petal Pink, Sunny Yellow, Island Green, Satin Chrome, and Antique Copper. (Interestingly, pastel colors for the kitchen were touted as "new" at the Chicago Housewares Show this past January). 1944 - Model K-3B replaced the model K-3A, with few changes. Has only a multi-purpose beater. There is no dough hook or flat beater made for it.